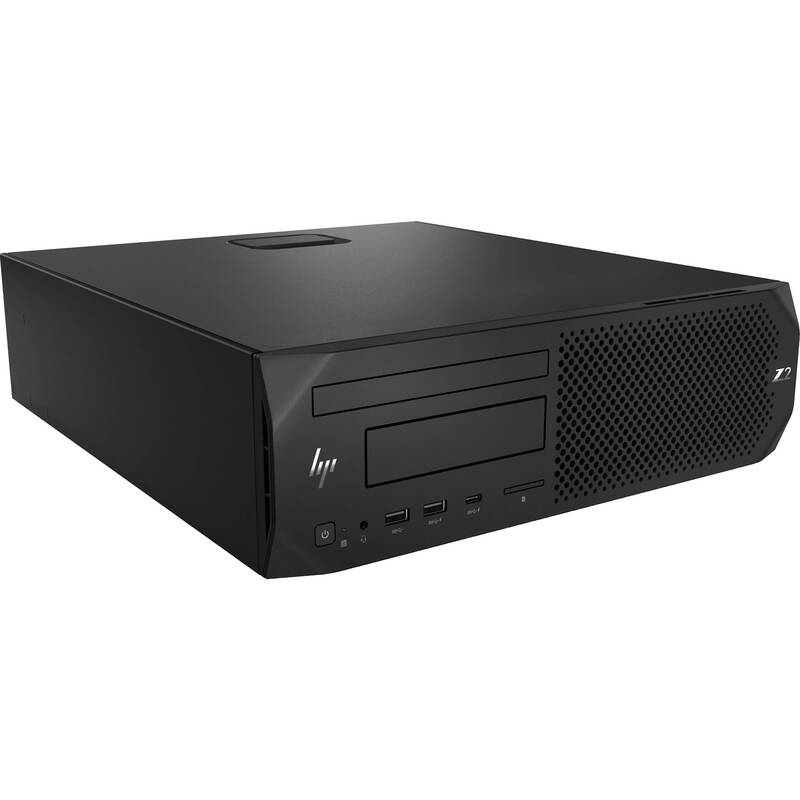 The Z2 G4 Small Form Factor Workstation from HP delivers next-level performance with a compact form factor that can handle single- and multi-threaded applications, including graphics-intensive 2D/3D CAD programs. Built for product designers rendering 3D models for project visualization, architects running 2D drafting and 3D design workflows, and OEM users undertaking mission-critical installations, such as healthcare and life sciences to command & control centers, the Z2 G4 is certified for SolidWorks, Creo, Solid Edge, AutoCAD, Bentley MicroStation, GRAPHISOFT ARCHICAD, Autodesk Revit, and Vectorworks. The system is powered by a 3.2 GHz Intel Core i7-8700 Six-Core processor that will allow you to run multiple applications simultaneously and can be boosted up to 4.6 GHz. The 32GB of 2666 MHz DDR4 RAM helps to ensure smooth multitasking and also allows the computer to quickly access frequently used files and programs. While the current memory configuration is 2 x 16GB, there are four 288-pin DIMM memory slots that will allow the RAM to be upgraded to 64GB, using a 16GB chip in each of the four slots. For storage of your files, the 512GB NVMe PCIe M.2 SSD offers quick access to your data. For additional internal storage, there is an empty 2.5" SSD bay, a shared internal/external 3.5" bay, an internal 3.5" drive bay, and one M.2 2280 slot for a PCIe SSD. If you want to add external storage drives or other peripherals, the Z2 G4 features six 5 Gb/s USB 3.0 Type-A ports, one of which doubles as a charging port, plus two USB 2.0 Type-A ports. The dedicated NVIDIA Quadro P1000 graphics card has 4GB of GDDR5 RAM and delivers a sharp, clear picture. You'll also be able to connect multiple external displays using its four mini DisplayPort 1.4 outputs at resolutions up to 5120 x 2880 @ 60 Hz. Whether you are listening to music, watching a movie, or playing a game, the integrated Conexant CX20632 5.1 audio codec outputs high definition audio and delivers higher fidelity than standard audio controllers. The Z2 G4 Small Form Factor Workstation includes a USB keyboard, a USB mouse, and a power cord. It runs using a 310W power supply that is 90% efficient and operates using 90-264 VAC at 47-63 Hz. The installed operating system is Windows 10 Pro (64-bit). The Z2 G4 SFF is a good choice for mission-critical installations, from healthcare and life-sciences to command & control centers. It can endure 24/7 operation, has a long product lifecycle with supported components, comes with a wide range of I/O ports for specialized & legacy equipment, a has a small footprint for embedded use cases. The 9.5mm Slim DVD Writer lets you read from and write to a variety of optical CD and DVD media. The system uses an integrated Intel I219-LM PCIe Gigabit controller for internet access when connected to a router, modem, or network switch. If you'd like to install a Wi-Fi/Bluetooth adapter, there is an empty M.2 2230 slot, which uses a PCIe 3.0 x1 interface. The Z2 G4 SFF features six 5 Gb/s USB 3.0 Type-A ports, one of which doubles as a charging port, and two USB 2.0 Type-A ports that will allow you to connect external peripherals such as hard drives, printers, and memory card readers. These fast speeds mean you can spend less time waiting and more time focusing on the task at hand. Two of the USB 3.0 ports are in the front and four are in the rear, while both USB 2.0 ports are in the rear. Four 288-pin DIMM slots support up to 64GB of non-ECC unbuffered 2666 MHz DDR4 memory. Expand or upgrade your system's internal storage with one internal 3.5" bay, one shared internal/external 3.5" bay, one 2.5" internal SSD bay, and two M.2 2280 slots that use a PCIe 3.0 x4 interface. Expand your system's components using one PCIe 3.0 x16/16 slot, one PCIe 3.0 x4/x16 slot, and two PCIe 3.0 x1/x4 slots.